I'm not sure there's such a thing as a true generic role-playing game, although they gave it a jolly good try back in the 1990's. Any system brings with it certain assumptions of play that mean that it will be good at some things and not so good at others; just look at the d20 version of Call of Cthulhu with its tenth-level librarians. Even Fate -- a game that's suggested within five nanoseconds of someone posting a "What system should I use for this idea?" thread on rpg.net -- has certain assumptions about storytelling styles built in that make it not the best match for, say, a tactical military type game. That said, the relative failure of concept inherent in the game does not diminish my affection for it one bit. It is for the most part a light and simple ruleset and -- as I'm sure you're well aware and more than a little bored of being told by now -- I much prefer uncomplicated systems in my games. It's simple enough that it manages to squeeze a complete multi-genre rpg into fewer than two hundred pages -- as you'd expect, additional setting books expand on the rules, but all the basics are included -- and a game is always off to a good start with me if the whole thing fits into one volume; I'll have none of this artificial separation into player and gamemaster books, thank you. The current edition of the game comes in what they call an "Explorer's Edition" but the rest of the world calls "A5", the game book format of kings, and at just under seven quid one doesn't have to be a king to afford it. With a few exceptions -- almost all of which are elsewhere in this top ten -- whenever I think of a new idea for a game, running it in Savage Worlds is my first thought. I've got notes here for Hellboy-style monster-hunting game, a post-apocalyptic hexcrawl full of radioactive mutants, World War II soldiers zipping around Europe in a tank searching for Nazi gold, and a modern gonzo pulpish thing inspired by lucha libre, Tarantino and Rodriguez, and the Wii game No More Heroes. There are even some cases where a setting already has a system attached but I would supplant it cuckoo style with Savage Worlds; I've found that it's a great match for Eberron, despite my fondness for West End Games' d6 rules I've long pondered a Savage Star Wars game, and assuming one could bolt on a decent martial arts system -- an odd omission from the sizeable body of material published for the game -- I reckon that Savage Worlds would do a better job of Feng Shui than Feng Shui did. Is a vast stack of unfinished campaign ideas a sign of a good role-playing game? 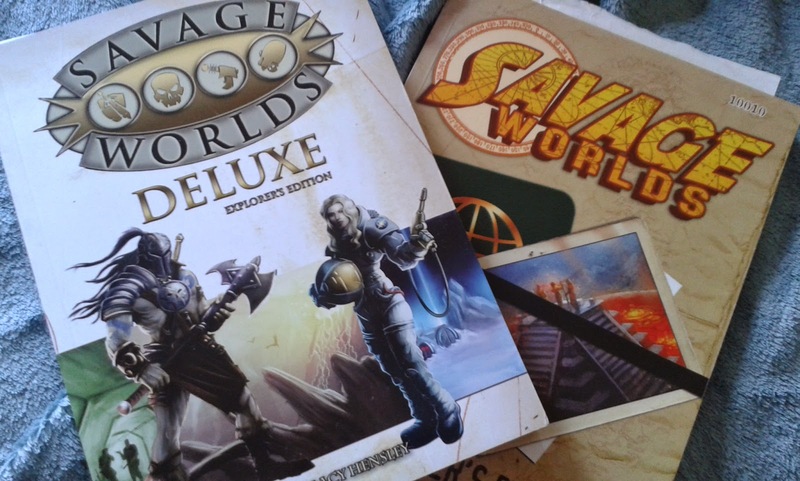 I don't know, but the fact that Savage Worlds inspires me to such an extent must be a good sign. Anyway, it's a wonderful little game and it's one of the few entries in the list about which I have nothing negative to say; the only reason why it's not higher in the list is because my top three games are untouchable in their greatness. Next: we're knights of the Round Table. Damn, the rpg world has moved on so muh from when I used to DM. Games I've not even heard about? How sad is that? But then, I suppose once out of the rpg loop what should one expect? I keep asking my old players if they want to do a one-off session before the new year, and I get all the enthusiastic noises, but none of them can get the timings to coincide for a game day. Grown-up life and responsibilities of a family are the kiss of death for the ageing rpg player and dm. I fell out of the hobby for about ten years, during which time the original publisher of Dungeons and Dragons had gone bust and the game itself had gone through two editions, so I know what you mean! I have a worrying suspicion that my own group is going to implode, with one member moving to a nearby town and with a baby on the way. I hope we can hold it together! I may have to disappear for a few months due to the insanity caused by fatherhood but, to quote Arnie: "I'll be back!" Savage Worlds looks ideal for my Sons of Anarchy / Supernatural crossover.